It seems like every concours this year, at least east of the Mississippi River, has endured a rain threat. The Amelia Island weekend was compressed into Saturday because of the forecast. A sodden golf course at the Greenbriar caused cars to be displayed on the circle in front of the hotel and in “The Bunker.” The Elegance at Hershey endured rain during the afternoon. And, like the Greenbriar, the show at the Trump National Golf Club had to be moved off the spacious golf course because of rain the day before the concours. The bad news was that the cars would be displayed in much more cramped quarters; the good news was that the areas chosen to display the cars allowed convenient access for spectators and for the cars to be attractively displayed. It was the right decision, and it was a good one. Interesting color combination on this 1930 Duesenberg LeGrande-bodied Dual Cowl Phaeton, but it works. 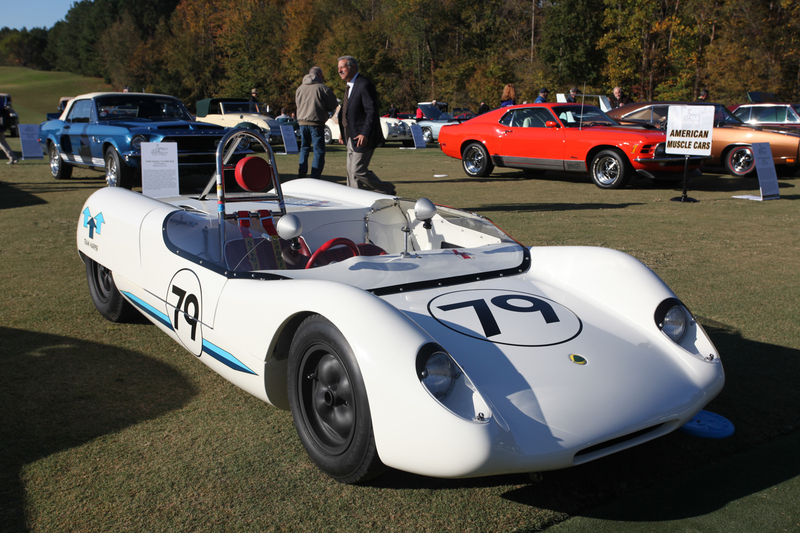 The day of the concours, Saturday, November 10th, was a beautiful, crisp day. It was sunny with just a bit of fall chill in the air. 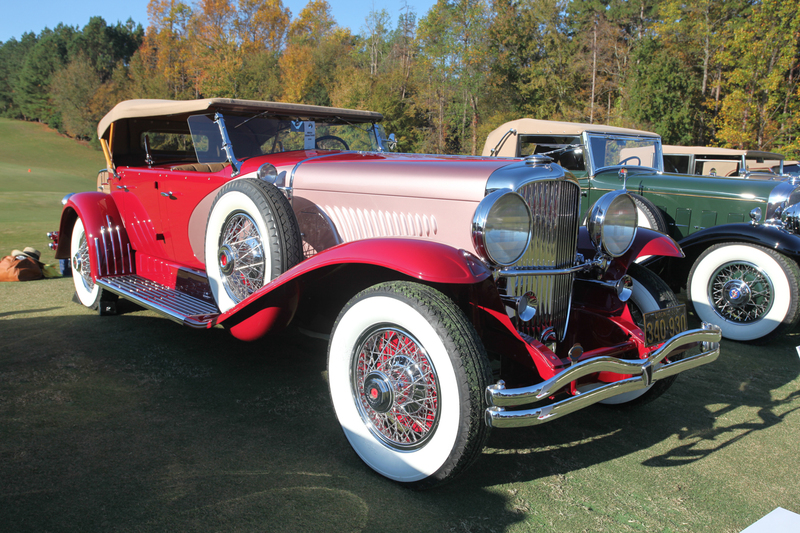 Like Hilton Head and Amelia Island, the organizers of the Trump Charlotte Concours d’Elegance invite members of local car clubs to display their cars in an area separate from the concours field. Unlike the others, the club cars are displayed on the same day as the show cars. When the entire golf course was available, there was plenty room. This year, the organizers had to be clever about how to use the space available to them. 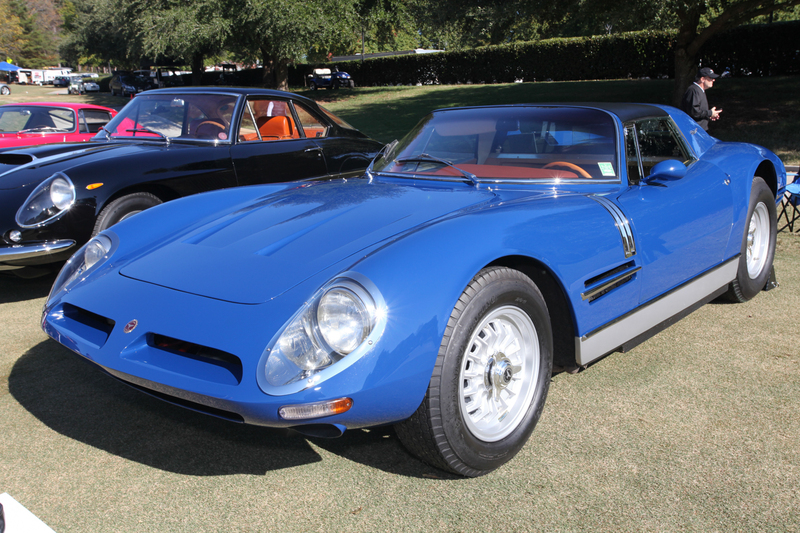 Concours cars were displayed on the Red Show Field, an area originally designated for members of the club and special invitees, and a smaller lawn areas adjacent to it where Italian sports cars of the 1950s and 1960s were displayed. 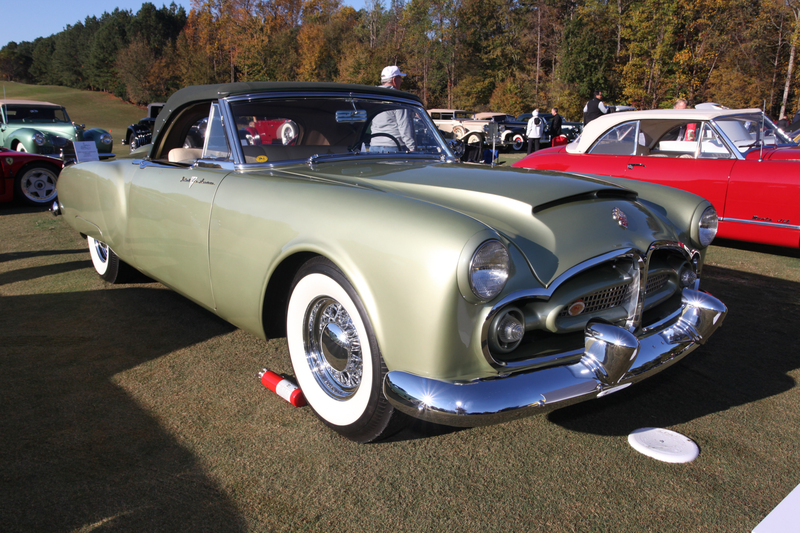 A few of the concours cars were displayed on the lawn in front of the club house. 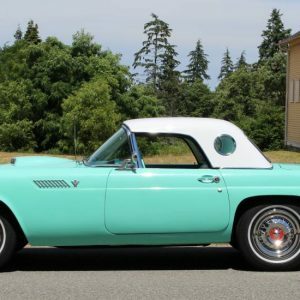 A parking lot, originally designated for club members and concours judges, was used for two large groups of club cars – one level for Corvettes and the other for recent Italian exotics. The remainder of the club cars were parked around Meeting House Circle in front of the club house and administrative buildings. A final group of cars that were not to be judged were displayed next to the lake in an area designated as the Director’s Choice Display. All these were in easy walking distance of each other. Food and drink venders were also moved to be convenient to attendees. 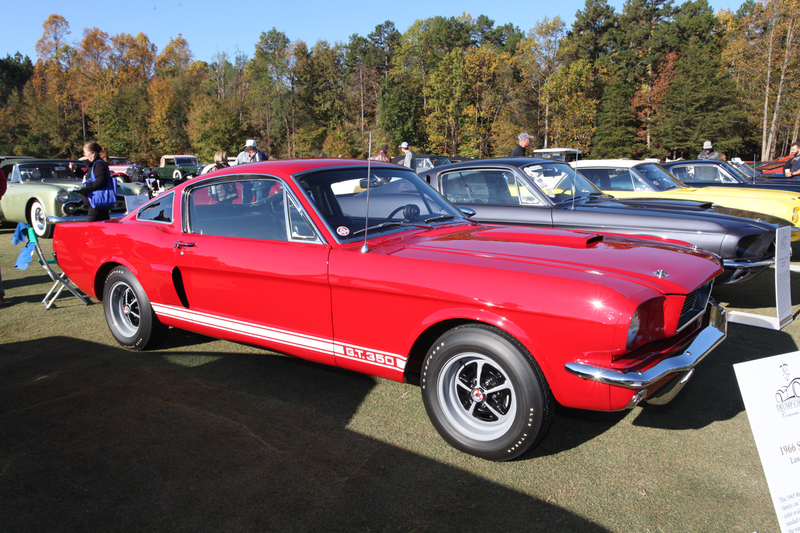 1966 Shelby GT 350 – exactly like my first new car. One of five bult for the auto show circuit. 1952 Packard Pan American. 1962 Lotus 23B – still looking good after all these years. 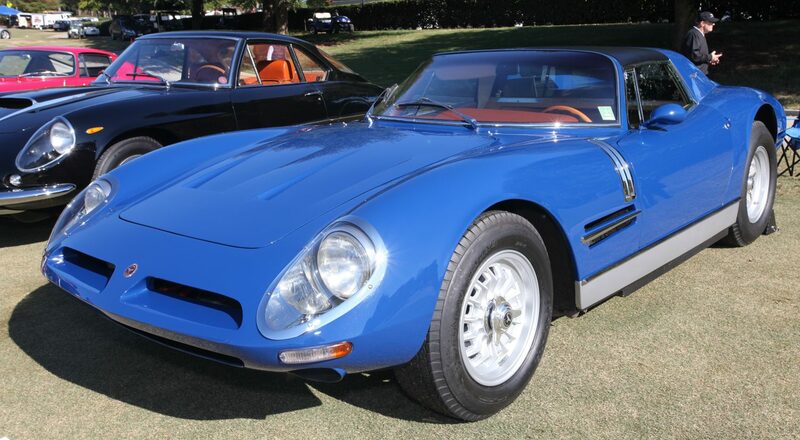 Bizzarrini Spyder – Lust in my heart!